Recycling electronics in Bradbury is easy and efficient with All Green Electronics Recycling. Bradbury is located in Los Angeles County at the foothills of the San Gabriel Mountains. In 2009 it had 1,069 residents, making it the third smallest city in the county. Help keep this city clean and e-waste free with All Green! All Green Electronics Recycling will recycle any electronic device. Schedule a pickup or find a drop-off location, but whatever you do, don’t throw your electronics in the trash bin! 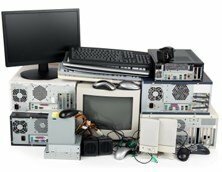 Electronic equipment is highly toxic to the environment, and at All Green Electronics Recycling we guarantee your electronic devices will not reach any landfill, including those located overseas. "I want to give a shout out to All Green Recycling for the great job and quote we received for recycling our used toner cartridges and various non-working printers. As a company we have been collecting used cartridges and old printers over the years and they just kept piling up. So I took a chance and call All…"
"Great job, easy to manage. Janae helped me with a quote and to arrange for the pickup of my old computers at our office which we were no longer using. Would definitely use them again – affordable and professional." "This was the second time our company has used All Green Electronics! The first time was great and Janae made our second time even better! We experienced prompt and efficient customer service every step of the way!! Janae made sure our scheduled time was set and even called back to tell us she had an earlier pick up…"